Have you ever had a teacher, aide, principal, yard duty, or other school staff member made a positive difference in your life? 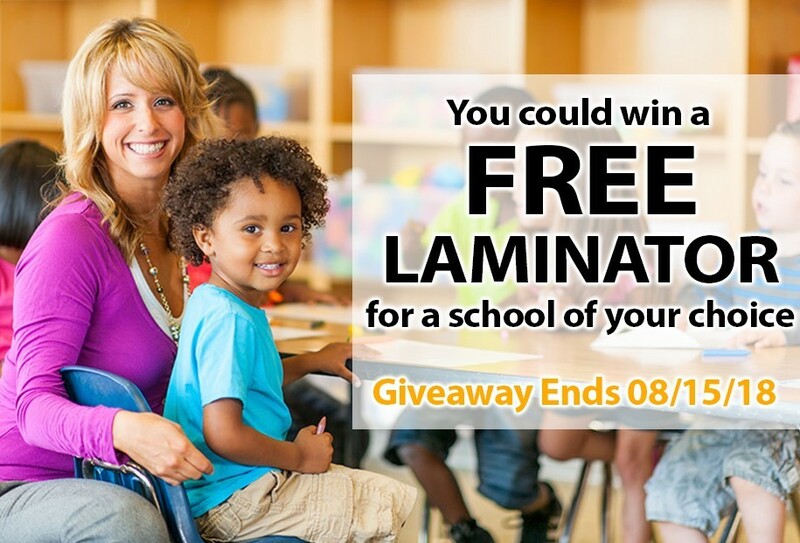 Now is your chance to give back to them by entering to win a free Sprinter-Lam pouch laminating machine for the K12 school of your choice. The Sprinter-Lam desktop laminator retails for $525.00, but if you're our one lucky winner, you get to gift it to the K12 school of your choice, absolutely free! NO PURCHASE NECESSARY – No limit to the number of entries allowed per person. Void where prohibited by law. This contest is only valid in the USA and US Territories. You must be 18 years of age or older to enter. One winner will be chosen at random on or about 08/17/18. Contest ends 11:59:59 ET on 08/15/18. Click here for full contest rules. Offline entries contest may be sent to: Binding101.com PO Box 1308 Little Falls, NJ please include name, address, email address, phone number and age on a standard index card for your entry to be validated.